On 16 October 2018, the square outside a cinema in the centre of Jalalabad was transformed into a jobs fair. Despite almost constant rain, an estimated 500 people dropped by. 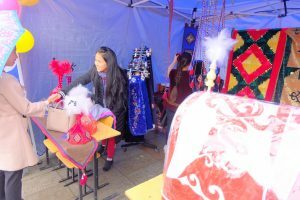 The proximity to the market, shops and offices meant that the Fair attracted many casual visitors as well as specially invited guests. 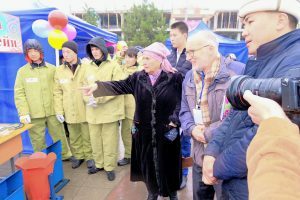 The fair was the culmination of six months of intensive work supported by INTRAC and Ebert Foundation-Kyrgyzstan with their partners Jalalabad Civil Society Support Centre, Jalalabad Employment Department, and the Youth Council of the Federation of Trade Unions. It benefitted from the very active involvement of the Mayor’s Office and the Social Protection Department in Jalalabad at all stages in the planning and preparation. Their aim was to raise the issue of workers’ rights and bring trade unions and NGOs together in promoting the International Labour Organisation’s ‘decent work’ agenda, an agenda that is also central to Goal 8 of the Sustainable Development Goals. A major function of the fair was to help young people (and older people too) to find work and vocational training opportunities. Employers present included major Jalalabad firms – the Electric Company, the Bai Butum bank, the Kelechek food processing company, clothing firms and social enterprises set up by people with disabilities. Boards displayed about 200 vacancies from Jalalabad, and 200 jobs from the Russian Federation. The Employment Department reported afterwards that 85 people had found jobs through contacts made at the fair. 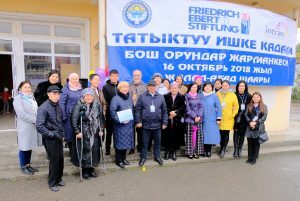 Speakers from the Civil Society Support Centre, City Social Protection Department, Employment Service, deputy mayor, INTRAC, the Youth Council of the Federation of Trade Unions, and a local employers association opened the fair. It attracted media attention, with the presence of several journalists and full coverage of the event on local TV for three to four days. The jobs fair also sought to inform youth about rights at work and to create a platform for discussion of key issues around youth employment. Discussion groups were formed around four topics. These had come out of research that INTRAC trainers had facilitated on youth and employment in summer 2018. Data were collected by youth, NGO and trade union activists, supported by two training and coordination workshops. A survey was undertaken of 100 workers from the formal employment sector (municipal staff) and the informal sector (waiters in large and small cafés). Expert interviews and focus groups provided a wider view of labour market issues, employer expectations and the experience of young workers (including those with disabilities) in different economic sectors. Most of the workers interviewed in the research found work through friends or relatives, with young women relying more on family contacts (35% of respondents) than men. While the job centre is perceived as doing good work, not all youth apply to it. Respondents were asked what skills or abilities are useful in finding a job, and many noted that good communication and teamwork is important. As regards expectations, young men put a good salary slightly higher than young women but mostly the two sexes showed similar results. While municipal employees have contracts, waiters do not. Only 2% of respondents in the research cited a written contract as one of their main criteria for choosing a job. The survey also asked questions around forms of payment. The answer was weekly pay without bonuses or overtime payments, even when long hours are being worked, with 12 hours not being unusual in cafés. Unions can help to raise the issue of decent work, which has many aspects beyond salary. However, the research showed a general lack of knowledge of rights. Some 28% of respondents had experienced a conflict at work, but only 4% of all respondents had approached someone to help, and none had approached a union. The final topic explored in the research was discrimination. A significant number of respondents did not agree that equal opportunities policies operate at their workplace. The lack of knowledge of labour rights or the potential support from trade unions makes it difficult to tackle discrimination issues. The presenters from the discussion group on discrimination noted that they had to deal with several difficult and provocative questions. This included “Have you yourself experienced discrimination at work?” and “What does discrimination mean to you?” One issue raised was about the wearing of headscarves in university. Taking steps to promote decent work – where next? There was considerable enthusiasm for the discussion groups, with the tents hosting the debates visited by large numbers of people all talking and asking questions. This was not an easy forum in which to present research findings, but well-planned presentations and support from invited experts who contributed vital information, meant that the discussion group coordinators were able to cope with the rush of visitors and enthusiasm for the debate. Partners came together after the jobs fair in Jalalabad and Bishkek. Follow-up ideas include an invitation to present the research and run discussion groups at a national conference in Bishkek; a suggestion to run more job fairs next year in Jalalabad; and a request for training from the employers’ association JIA. Many thanks to the local trainer team: Chinara Jusupova (CSSC), Anara Moldosheva and Chinara Irisova (independent experts) and Zarina Ibraimova (INTRAC) who coordinated the administration and financial side for the whole event.